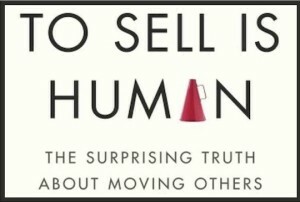 This is Dan Pink’s most recent book and follows ‘A whole new mind’ and ‘Drive -the science of motivation’ and the accompanying TED talk on motivation which can be found here if you’ve not seen it. I’m a big Dan Pink fan so I’m a little biased. Drive should be read by everyone – parents, teachers and business people alike. As indicated by the title it clearly explains a lot about motivation – which we could all benefit from understanding more about. The other thing I like about Pink’s writing, is that it’s backed up by research and lots of it. Mostly social science and behavioural psychology research which he uses effectively as cases studies and evidence to reinforce his points. On the back cover is the line ‘We’re all in sales now’. And we are – in the new economy, whether we realise it or not. He goes onto explain, ‘Each day millions of people earn their keep by convincing someone else to make a purchase. They sell planes to airlines, oil shares to sheiks, cars to drivers. They sell consulting agreements, magazine subscriptions, time-shares, double glazing, broadband, fitted kitchens, car insurance, life insurance, pet insurance! Some work in fancy offices with glorious views, others in dreary cubicles, but most look exactly like you. I remember being part of a ‘traditional’ sales team a few years ago – complete with a mobile phone and company car which were displayed like badges of honour, and people saying to me ‘I could never do what you do. I could never sell to people’. 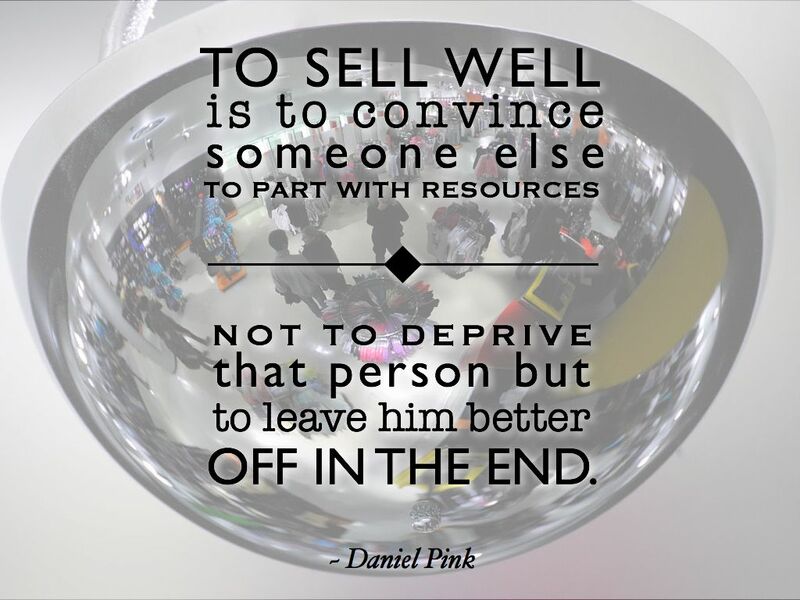 But I agree with Dan Pink in that ‘we’re all in sales now’. So if we are, why not understand how we can be better at it, to consistently get more of what we want and to make the process easier and more likable for all involved as no one likes being ‘sold at’. The answers lie within the pages. Buoyancy is about mind set, the questions we ask ourselves and about ratios of positive to negative emotions we experience and the effect they have. Clarity is just that. Clarity of message or ‘pitch’ and what it is exactly that you want others to do. 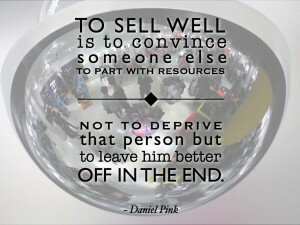 Within the sections, Dan Pink continuously reveals useful and actionable insight. In attunement, he dispels the myth that to be in sales and perform well, you need to be extroverted. In fact, quite the opposite as extroverts tend to talk too much and listen too little which is the opposite of attunement. He introduces ambiverts who from research far outperform extroverts in sales. They just tend not to fit the stereotypical view of sales people. In Clarity he discuss the shift in perspective from problem solving versus problem finding due in part to the new status of information asymmetry between buyers and sellers. Buyers now have access to a wealth of information, product reviews and views on the internet and through social media, which redresses the previous imbalance where the seller held and controlled all product information putting the buyer at a distinct disadvantage. He also talks in Clarity about frames of reference which leads to a great questions when framing your own offering by asking ‘compared to what?’ Being able to answer this and see things in different frames or perspective as your customer does is a subtle art but one that’s worth pursuing to great effect. Other frames he discusses include experience frames and purchases – material purchases versus experiential purchases with the latter being more fulfilling and memorable to people who bought for the experience rather than the possession or item itself. The two questions for instant influence borrowed from ‘Instant Influence’ by Michael Pantalon are intriguing. I think I’ll try these first on the kids though to perfect, before unleashing on prospective customers but I can see them working! One thing I have applied straight away is Pink’s six pitches. He touts it as a successor to the elevator pitch. You know, it’s what you’d say in about 60 seconds if you happened to get into a lift with your prospect and you’ve got 60 captive seconds with them before they get out. It’s a really insightful and a great exercise to do. I’ve written all six pitches and it really makes you think clearly about your message and what you’re trying to convey. The ‘serve’ chapter at the end of the book pulls everything together by looking at what it is to truly serve with a personal and purposeful approach. He outlines research experiments by Adam Grant and David Hofmann that indicate that purpose is a performance enhancer and a significant one to boot. In one study, two groups from a U.S University call centre were tasked to raise money from previous alumni for the school. Before starting work the target group read case studies about pupils who have benefitted from receiving scholarship from the school and how it had changed their lives. The stories made the work personal and purposeful. The control group just read random stories. The result was that the target group more than doubled the amount of money raised compared to the control group. That’s double. 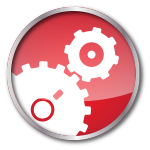 Who wouldn’t want their sales team to double their performance? If the person you’re selling to, agrees to buy, will his or her life improve? When your interaction is over, will the world be a better place than when you begin? This book will definitely be a go to reference source for me to make sure I get the most out of it. I hope you do too.